I can't speak highly enough of the TOS Magazine. It is one of my absolute favorites. Receiving the latest edition in my mailbox is like a small taste of Christmas morning to me . . . a present just waiting for me to unwrap it and start reading. The magazine alone is worth the money. To get all of these free gifts too . . . well, that is just icing on the cake. How about some freebies while you wait? 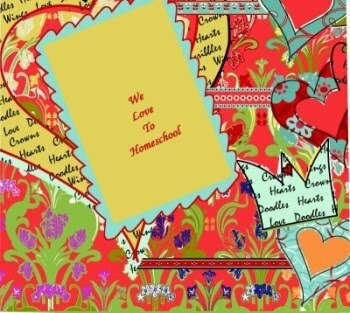 Here are some great free homeschooling resources. Disclaimer: I will receive a $20 TOS coupon for posting this ad. The above is just my opinion. Please remember that opinions may, and do, vary. For more information, click here. Sample pages are also available. 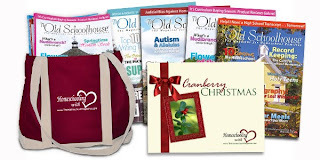 When it came time for the TOS crew to review products from Bright Ideas Press, they gave us a few choices. I decided to review this book about composers. It was a topic that I feel my children could benefit from. So I decided to give it a go. I have heard, as most of you probably have too, that exposure to classical music has an impact on brain development, especially in younger children. Some even suggest playing classical music while you are still pregnant with your baby. Recent studies show that taking music lessons improve brain development and memory. So, I wanted to make classical music more a part of our lives and our curriculum. So far, I hadn't done much about it. I did buy a CD that introduces children to the classics. And every now and then, I turn on the classical station in the car. But not much more progress had been made. That is why, when this book was suggested, I picked it. When the book arrived, I was glad to see it. It has a pleasing appearance: nice size, paper-back, two-tone pages, musical notes in the borders. Its appearance invites you to open it up and visit a while. 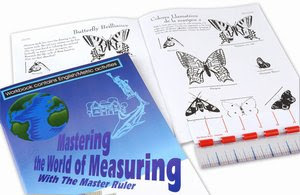 It is designed as a full year's curriculum, 32 weekly lessons. It is also designed to cover one composer over 3 days. 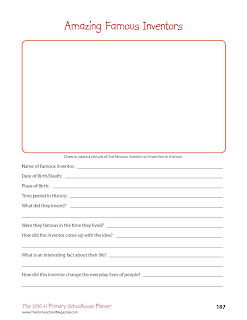 *Fill in the note-taking pages or answer the Student Review Questions. *Listen to the recommended selections again. *Fill in the Composer Info-Card. *Match the composer to his place of birth. 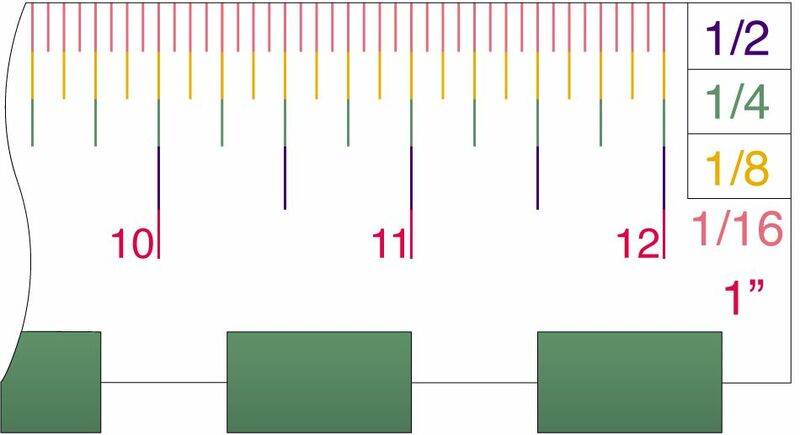 The composers are divided into the musical time periods, from Baroque to Contemporary. The composers bios are each a few pages long (most are 3 to 4). Students will learn about the composer's childhood, marriage, children, whose music they were influenced by, who was influenced by their music, what they were best known for, their faith in God, and other interesting facts. - Chopin had this to say of England, "Their orchestra resembles their roast beef and their turtle soup; it's strong, it's famous . . . but that is all." - Despite the fact that Verdi produced biblically themed operas, we know he did not have a good opinion of Christianity. - A classmate of Debussy described him as "uncommunicative, not to say surly; he was not attractive to his friends." So you see, you learn not only about the composers' music, but also about their lives. This adds interest and depth to the study, in my opinion. I like the extra stuff, in addition, to just reading the lessons. It helps make it more interesting and helps the facts to stick. - Links to YouTube videos of the composers' compositions. - Review pages for each composer, usually 10 questions. Fill in the blanks, multiple choice, true or false, etc. - Coloring sheets. Extremely nice, detailed pictures of the composers. - Directions for making a Folderbook. Kind of like a lapbook, but more simple. 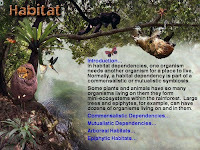 - Lots of great resources for a more in-depth study of some of the individuals covered in the book. 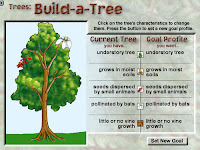 - Useful websites for more information. - Composer Cards. These are really cute and can be used in the folderbook. - Illustrations for the composer cards. So this book is so much more than just the lesson. It is a well-rounded classical music curriculum. I am impressed with it and plan to continue using it. The recommended age is 4th - 8th grade. But I think it is a bit much for 4th. It is a lot of information ( dates, new vocabulary words, unfamiliar cities and names). I don't think my 3rd grader is going to retain much of it. But I think it is worth it to expose her to the information and then return to it again in a few years. My 6th grader will get more out of it now, and then will get a review in a few years. 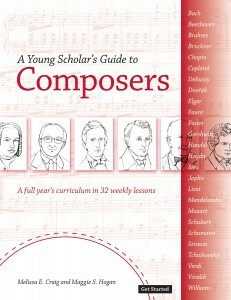 Disclaimer: I received the Guide to Composers free of charge, as part of the TOS Homeschool Crew. The above is just my opinion. Please remember that opinions may, and do, vary. Visit Our Best Daze blog to enter the contest. Various hands-on activities related to American Indian, pioneer and colonial, frontiersmen, and leather working. Check out the discontinued and special items category. Enjoy making a doll quilt using the same techniques the pioneers did. The kits are manufactured in the United States. I have always thought quilting was such a neat skill. There is just something about a homemade quilt. There is often a story behind it. Scraps of cloth from a baby's first outfit, a daughter's Christmas pjs, or a son's favorite shirt. Pieces of their lives and their history transformed into a quilt to be shared for years to come. For the past few years, I thought about learning how to make a quilt. But one problem is that my sewing skills are limited to very basic hand-sewn mending. Definitely nothing to brag about. And the other problem, I learn best by watching someone else do it . . . and I don't have any close friends or family that quilt (at least not to my knowledge). So, when I received the quilt kit I didn't know if I was happy about it or not. I liked the idea of making a little baby quilt. But I wasn't so sure I could figure it out just using a small sheet of instructions. 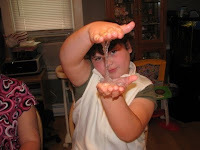 My daughter has taken 2 hand sewing classes at our homeschool co-op. She has learned a lot and is at least my equal at it now. But the difference is she actually enjoys it. She offers to mend clothes, designs her own patterns, and was very eager to try the quilt. So I considered having her make the quilt. But I didn't feel like I could do a fair review on the quilt unless I made it myself. And I decided that it would make a nice gift for my daughter's upcoming birthday. The instructions were detailed enough. Step-by-step instructions. And some illustrations. 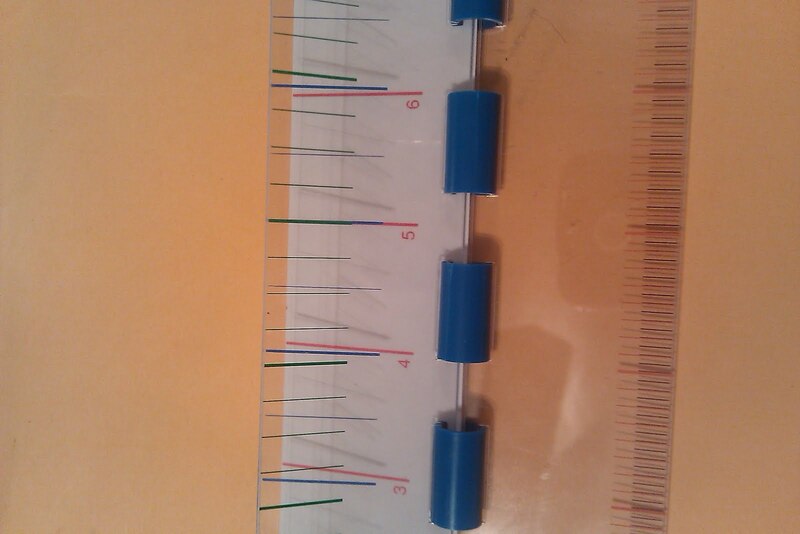 The paper instructs you to sew a 1/4inch from the edge, not more and not less. Nice, neat, even. Which would be beautiful, but I don't have that level of sewing skill. It also suggests that you iron each patch that you sew. But, I hate ironing. Well, I think it is coming along nicely. I have spent hours hand-sewing my quilt patches and it looks pretty. Not perfect, not professional. But pretty. At first I didn't enjoy it. Did I mention that I don't like hand-sewing. (And I don't know how to sew with the machine.) 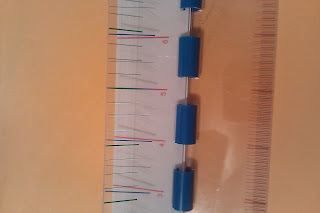 But as I moved along with the project, I did get the hang of it and my speed increased. And even as an amateur, I now feel that this kit has given me the instruction and confidence I need to feel like I really can make a quilt. I don't know that I would ever make a full-size quilt. Not sure I have that much desire or patience. 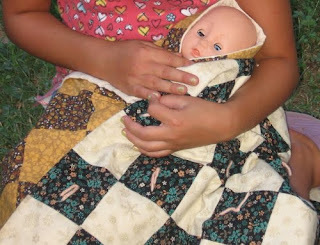 But I think I could make a baby-doll size quilt. I like the feeling of satisfaction and accomplishment. And I think they would make wonderful gifts for my daughters and nieces. I like the concept of these kits. One, for anyone interested in learning how to quilt. Two, for the historical significance. It helps you to feel more a part of the "olden days". Corps of Re-Discovery offers several different kits from American Indian, pioneer and colonial, frontiersmen, and leather working. The kits include most everything that you will need. 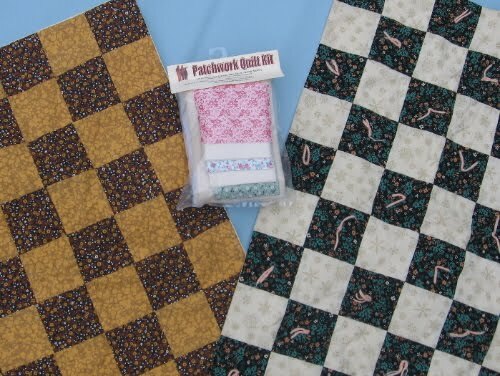 For the quilt kit, I received everything I would need except for the needles. Would you like to read more reviews? Some crew members received different kits. Disclaimer: I received the quilt kit free of charge, as part of the TOS Homeschool Crew. The above is just my opinion. Please remember that opinions may, and do, vary. 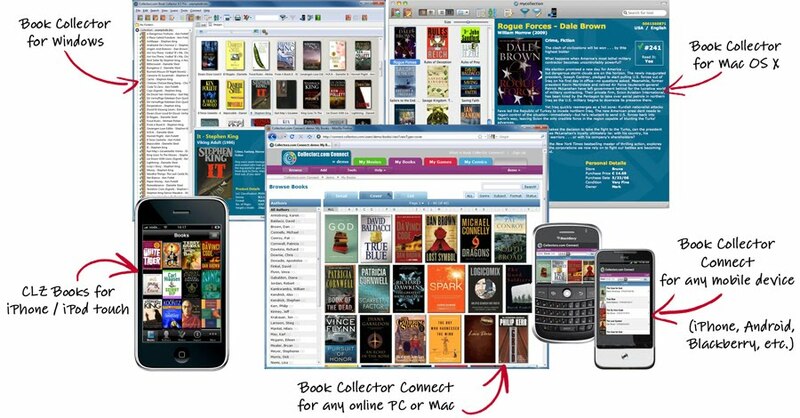 You can try Book Collector for free, but it is limited to 100 books. Catalog your book collection, simply by entering the ISBN number either by hand or by scanning it. 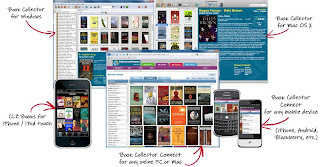 I have the opportunity to try out Book Collector from Collectorz. 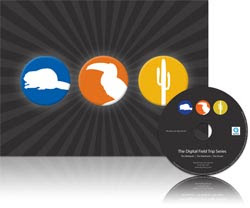 Collectorz offers several Collector Software choices, including for music and movie. I found it simple to enter my books into the program. Simply enter the ISBN number. Book Collector will look it up for you . . . pulling a good bit of information and automatically entering it under your book's title. It looks very nice and "official". Some of the information is your personal stuff. So if my family is doing a unit study on islands, I can search for "islands" on Book Collector and it will pull up a list of all the books that have the keyword of "island". What kind of things can you use this program for? Well, here are some ideas. I entered some books into the program and played around with the functions. It is a neat program with some cool features. It isn't something that I would use. I'm not that organized. :) But some people are. A friend of mine keeps all of his movies in a spreadsheet, so that visitors can choose the movie they would like to watch. Another friend keeps all of his video games listed in a spreadsheet so that he can easily see if he already owns a certain one. If you have a desire to do any of the these things, then this program is an easy-to-use solution. Very user-friendly with lots of automated features based on the ISBN. If you would like to read what my crewmates thought, click here. Disclaimer: I received Book Collector free of charge, as part of the TOS Homeschool Crew. The above is just my opinion. Please remember that opinions may, and do, vary. Yuck comes in 4 forms (Chunky, Sticky, Snowy, and Saucy). 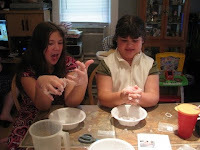 The product arrives in powder form. 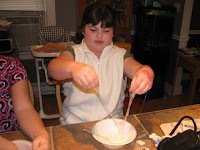 All you do is add the powder to water, stir, and watch what happens. For some demonstrations, check out these YouTube Videos. When I learned the name of the company is Buckets-O-Fun, I felt pretty sure our review product would be something that my girls would enjoy. When the package arrived, we eagerly opened it to see what we got. The company had mailed us 4 samples of their yuck products. Also, they included a list of game ideas and an observation sheet for the experiments. Pretty neat, huh? I carefully read over all of the instructions. 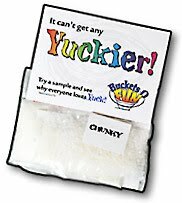 According to the info sheet, the yuck will absorb water and expand. For this reason, it is very important that you don't ingest it and also that you don't put it down any drains (sink, dishwasher, washing machine). Well, this did make me a little nervous. Not that I thought my children would eat it. They are 11 and 8. (Our almost 2 year old was hanging out with Daddy.) My concern was how we were going to clean up ourselves and our kitchen and our utensils, if we couldn't use the sink or dishwasher to do so. And yikes, what if this slimy mess spills on my daughters' clothes and I can't run it through the dishwasher? So anyways, yes, I began the experiments with a tad bit of trepidation. I began by moving everything off the counter that was of value. :) Then I stressed the "all-important Rule #1 -No washing it down the drain" and the "other all-important Rule #2 - No eating it" As the directions explained - "It absorbs water; need we say more?!". We started with the Snowy Yuck. 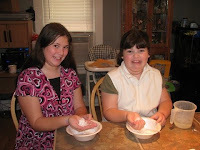 The powder resembles sugar. But almost immediately after stirring it into water, it looked so much like snow. It was pretty cool. One of the game suggestions is to use cookie cutters with the snowy yuck. I wanted to give this a try; it sounded like a neat idea. But our sample size was way too small for that sort of thing. 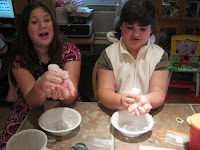 We played around with some of the experiment ideas: trying to make a snowball, adding salt, and freezing it. I won't tell you what we discovered; I will let you try it for yourself. Next we made the saucy yuck. It looks like powder until you put it into water. Stir and also immediately, you have a saucy mess. It is quite an interesting feeling! Up next, the slimy yuck. I really didn't want to try this one. But I kind of had to, since it was sent as part of the review. Ha-ha. And since my daughters have made their own "slimes" in the past, I knew how much they would probably enjoy it. So, I took the plunge. And they aren't kidding! This stuff is sticky! It was fun to play with. My girls stretched it between their hands and in and out of the bowl. They even managed to blow bubbles with it in their hands. Pretty cool! Cleanup, however, was not cool. It is very sticky and you can't wash your hands in the sink. The directions tell you ahead of time that cleaning your hands is going to require a lot of patience. And they aren't kidding. Lastly, we made the chunky yuck. This one isn't instant. It is a process of adding water, letting it absorb, and then adding more water as needed over a 24 hour period. This one was my favorite. It looked like ice cubes. Felt like jello cubes. Didn't stick to your hands and was easy to clean up. The verdict: My kids had fun making it and playing with it. 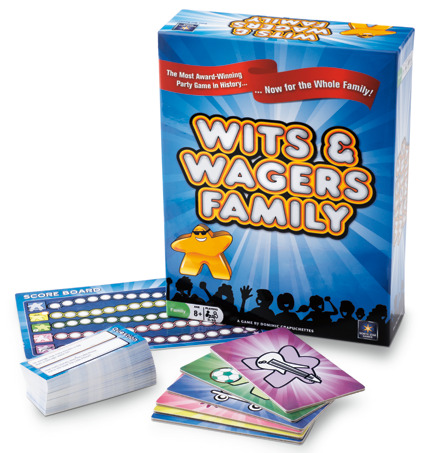 The kit includes neat game and observation ideas. They didn't enjoy clean up. It was a long and tedious affair to get it all wiped up and scooped off and thrown away. We used a lot of napkins and paper towels! Suggestion #1: I highly suggest that you use disposable items. This is what we did. 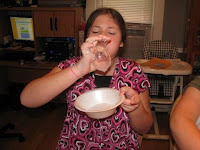 We used Styrofoam bowls, plastic spoons and paper towels. So everything went straight into the trash as we finished with it. This was a HUGE help! I can't imagine how we would have cleaned up the bowls and spoons well enough to feel confident putting them into the dishwasher after. Suggestion #2: Do these experiments outside! Seriously, I can't stress this enough. Had we been able to do these experiments outside in warm weather with a water hose nearby, it would have greatly simplified matters. We could have simply hosed everyone and everything off once we were finished and been done with it. Much better. Word of warning though. The directions do warn that you don't want to just dump it into an area where people will walk because it is slippery. It does decompose; so, dumping it into a garden would be a good idea. Otherwise, hose it off into an "out-of-the-way" area. Simple, easy, done. We only had sample sizes so we weren't able to do these neat things. And the weather wasn't warm enough either. But there were some super-cool ideas that we would have loved to try. Put the yuck on a slip-n-slide and slide away. Fill a wading pool and splash around. Fill buckets with yuck and hidden treasures and start digging away. Doesn't that sound like so much fun? Great ideas for a summer get-together or birthday party. Disclaimer: I received Yuck samples free of charge, as part of the TOS Homeschool Crew. The above is just my opinion. Please remember that opinions may, and do, vary. I have a 23-month old daughter. 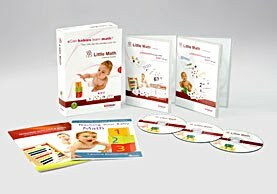 We have been using this program together on a regular basis. The recommendation is to use the program for 5 minutes in the morning and 5 minutes in the evening. It is intended to be a joint effort. Don't sit your toddler in a booster chair to watch it alone. Instead, sit there with your child and interact with her while watching the lesson. Choose the day that you are on; then choose Part 1 or Part 2. 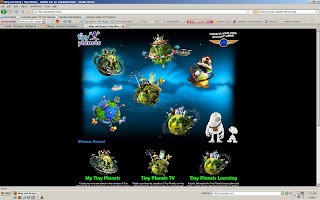 The lesson will walk you through the steps as you click the mouse or press the spacebar (depending on the option you choose). Let's take the example of the word: POINT. The screen will display and say the word: POINT. 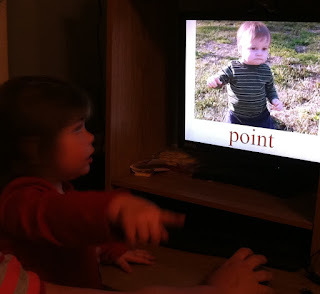 Then it will show a girl with her hand extended pointing and say something like, "Can you point?". 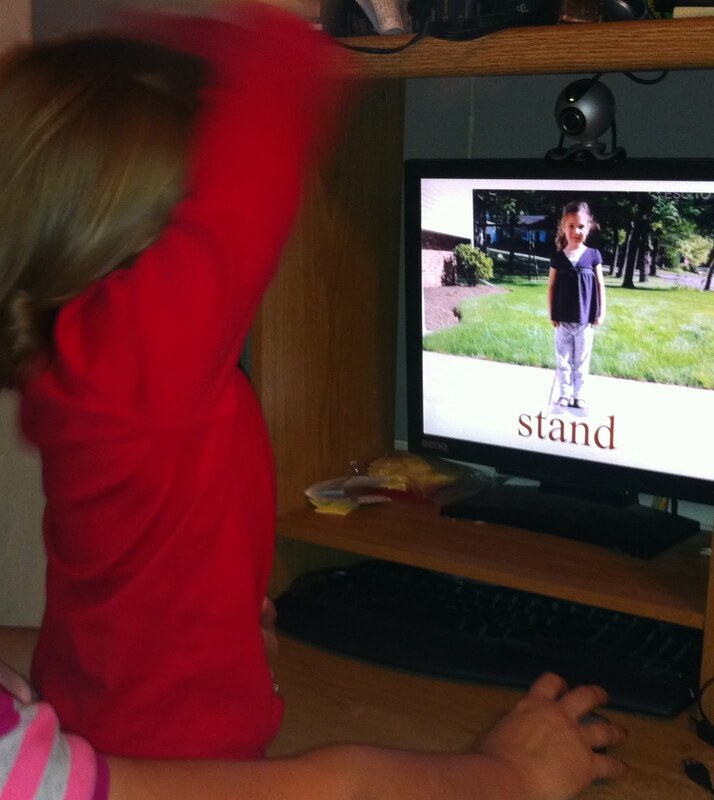 Then the next clip is a short video of a girl putting her arm up and down in the "POINT" position, while asking your child to do the same. Another example would be the word DOG. It will show the word DOG. The next screen shot is of a DOG and you will hear the dog bark. Next is a short video of a different dog. An important thing to mention is that the software has a couple of pictures and videos for each word. So there isn't just one picture of a child eating. There are a few pictures of different children eating. Then the videos are more different children. Some are real people and some are cartoon-like people. This is important because you don't want them to only associate the word to one image. Eating isn't just when that one person puts food in his mouth. Eating is when anyone puts food in their mouth. Same as with items like CAT. Little Reader uses more than one picture and video of different cats, so the toddler doesn't just associate CAT with that one little white fur ball in one picture. Another key factor is to progress through the screen shots quickly. 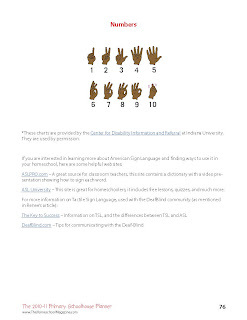 The instructions mention that this is important to the success of the program. During most of the lesson, this is up to you since you click to move to the next image. But during the review part, the lesson will quickly proceed through the words of the day on its own. When it is time for my daughter and I to use Little Reader, I tell her it is time for her to do school and ask if she wants to. She says "Yes" and comes over and hops in my lap. We go through the lessons for that day a few times, because she enjoys it and asks for more. I stop before she is tired of it because I don't won't it to be a chore for her and I also don't know if it is just too much information at one sitting for her. Does she enjoy? Oh yes! She sits still and watches and listens and interacts. When the program says, "Can you stand up? ", up she stands. When it asks, "Can you sit down? ", down she sits. 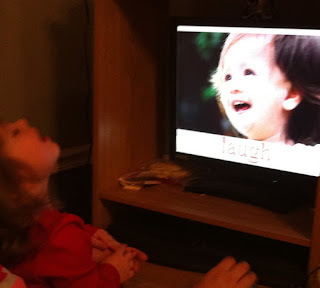 It is so cute when Little Reader asks her to laugh, because she does. It is funny because she isn't laughing because something was humorous. She is laughing simply because the lesson asks us to. Is she learning? Yes! 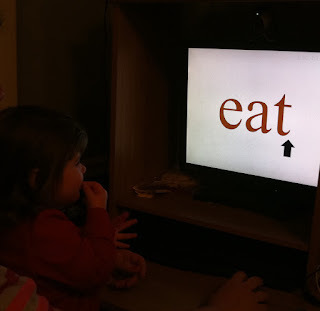 She has gotten to review and practice words that she already knows. She has learned some new words and their meanings. Is she learning to read? I honestly don't know. It is too early to tell at this point. But I do think that she will learn to recognize these words in the near future. I enjoy this program. My 23-month old daughter enjoys this program. 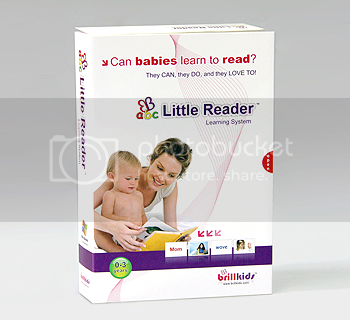 I intend to continue using Little Reader all the way through the 2 semesters of lessons. I am excited to see the results. I look forward to hearing my little one read these words within the next year at the age of 2. Please note: Little Reader is only compatible with Windows. 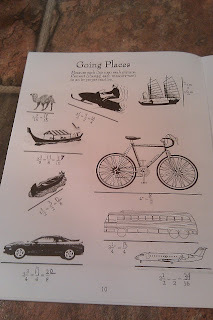 Disclaimer: I received Little Reader Basic free of charge, as part of the TOS Homeschool Crew. The above is just my opinion. Please remember that opinions may, and do, vary. This is so cool. I would love to win this. Want a chance to win too? 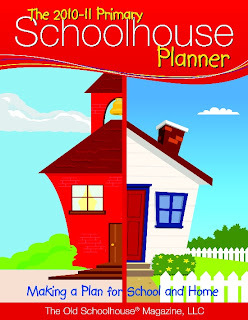 203 pages of forms, lists and helpful tips to help your K-3rd grade student get organized for the 2010-2011 school year. When I first heard that TOS was coming out with a Primary Student Planner, my first thought was "What would my 3rd grader do with a planner?" Sure, I can see why I need one. I have plenty of things to plan and organize and keep track of. But I couldn't see my 3rd grader needing or using one. So, when I received my planner, I was eager to open it up and see just what all the fuss was about. Now I see that there is plenty to fuss about, 203 pages worth of things to fuss about. The neat thing is that the forms are in a PDF file. Your child can't lose it. It is always right there on your computer. Your child can't run out of forms. He can always print another one. He also has the option of printing it out and then filling it in. Or, he can fill it out on the computer and then print it. I think that is a super neat bonus, especially for little ones who have barely mastered handwriting and aren't able to squeeze their letters into the spaces on forms. I like the lists about Jesus very much. What a neat way to get an overview of His life on Earth. 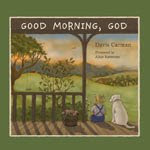 The planner has Jesus' miracles, parables and a timeline of events in His life. 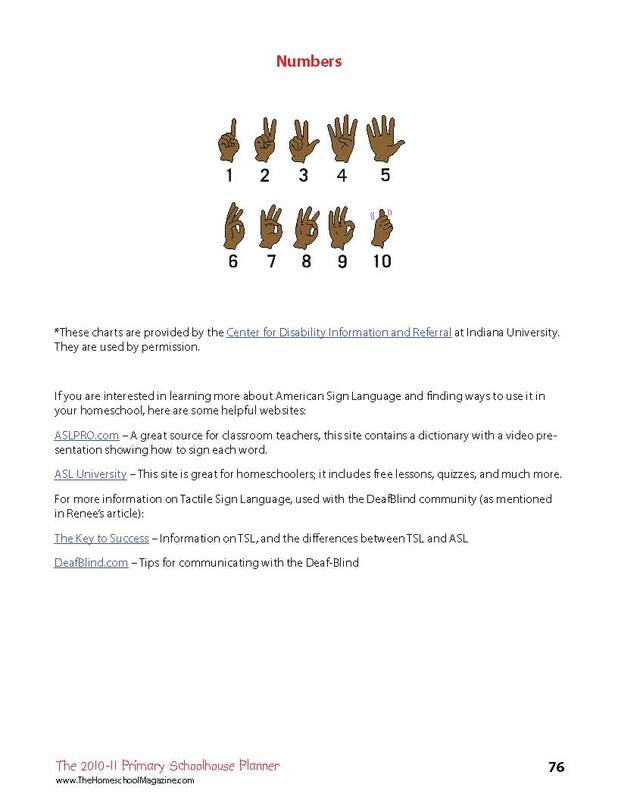 In my opinion, it would be beneficial for every student to know at least the ABCs in sign language. If a child ever needs to interact with a deaf person, she could at least spell out the necessary words. This is a much slower process, but in a pinch, it would do the trick. And guess where your child can find the ABCs in sign language. Well, in this planner, of course. 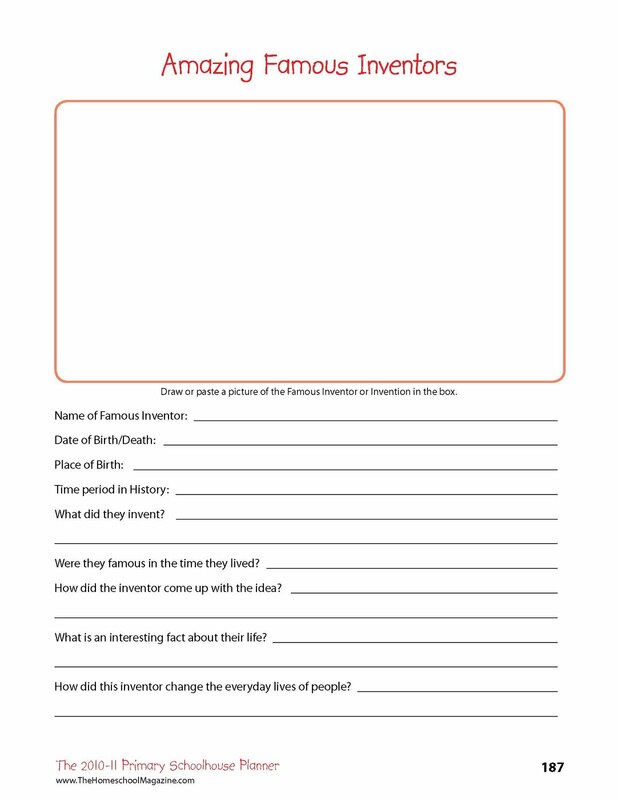 The timeline of inventions is so interesting. I found myself reading it just for the fun. Neat stuff, huh? There are tons more inventions listed. This would make a great jumping off point into some interesting research. Have your child pick one topic a month to delve into deeper. They will have lots of choices. And one of them is sure to prick their interest. 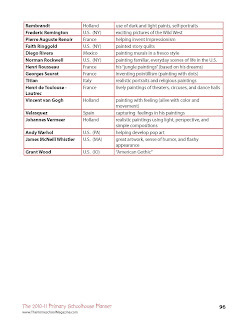 The list of famous composers is another of my favorites. It lists the composer, his birth and death, his country, and one or two of their famous works. Another great jumping off point. Your student can pick a composer once a month to study in greater detail. They will probably find the famous works online on sites like YouTube. They can listen to the music while doing some research about these famous men. 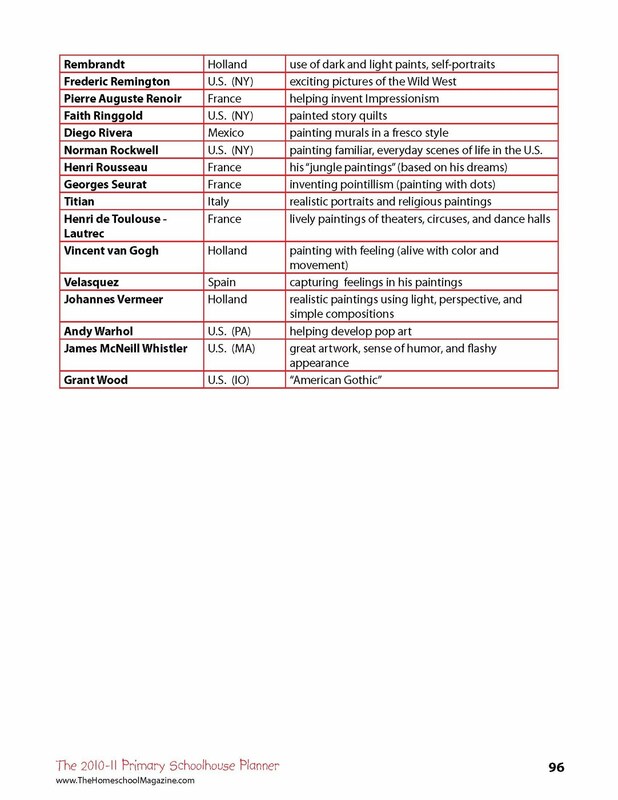 The Primary Planner has a similar list of famous artists, which will be just as useful. A variety of journal templates are included. Once your student finds the one she likes, the sky is the limit. Her journal is only limited by her imagination. A journal of nature observations, a journal of hopes and dreams, a journal of daily events. Okay, here is another favorite of mine. The templates for reports. These look sharp and are very helpful. They include a box for a drawing and questions to help summarize the learning. There are so many more forms provided in the Primary Planner. But I have listed some of my favorites. In my opinion, this is an amazing resource. It will help your primary student get organized, learn some really cool facts, and feel like one of the "big kids" with their very own planner. I received this Primary Planner, free of charge, in exchange for my review. The above is just my opinion. Please remember that opinions may, and do, vary. 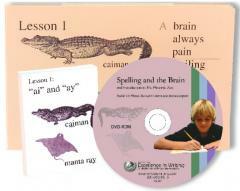 Here is your chance to win a great DVD from Franklin Springs Family Media. 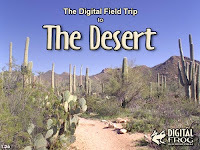 A digital field trip to the wetlands, rainforest, and desert. 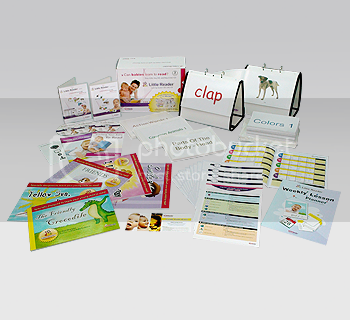 Includes workbook materials for the teacher and the student. When I heard of the company Digital Frog, I thought of digital frog dissections. I think this is a wonderful idea. So much less gross and stinky. 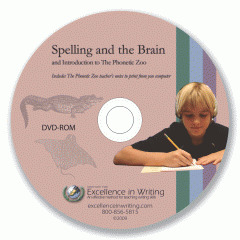 But what I didn't know is that they also make other educational CDs. One of these is the Digital Field Trip, the one that I received for review. Actually there are 3 field trips . 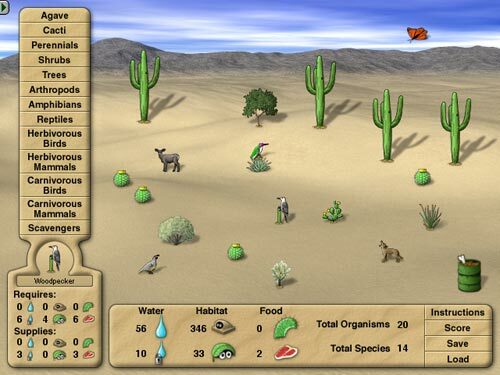 . . the Rainforest, the Desert, and the Wetlands. I received the combo disc containing all 3. 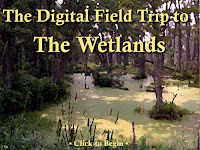 I have spent some time going through all 3 field trips . . . exploring, reading, playing, and learning. It took me some time to figure out how to navigate the program, but I finally found that the easiest way is to click on "MAP" and see which items didn't have a check mark on them. Those were the items that I still needed to check on. I also found the display screen of the field trips to be way too tiny for my enjoyment. So I was relieved when I found the preferences section, where I could change to "FULL SCREEN". Ah, that was much better. It is called a field trip and that is the first step of the journey. For example, on the Desert field trip, you pick from one of 5 deserts - the Saguaro West, Painted Desert, Death Valley, Black Rock or Big Bend. Find the place on the map. Then the panaromic view loads. You can survey the area and also zoom in and out. Click on the different posts along the trail to see all the sites. 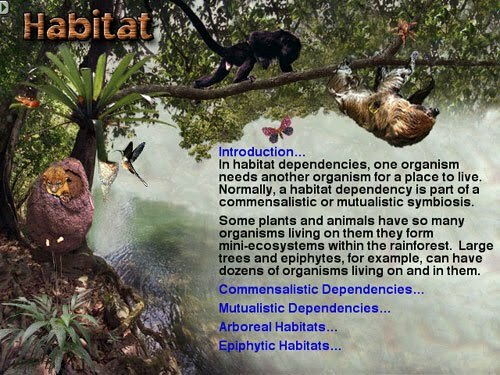 Interesting side notes are included, some of which are "clickable", like links that jump to individual animals inserted in the pictures. 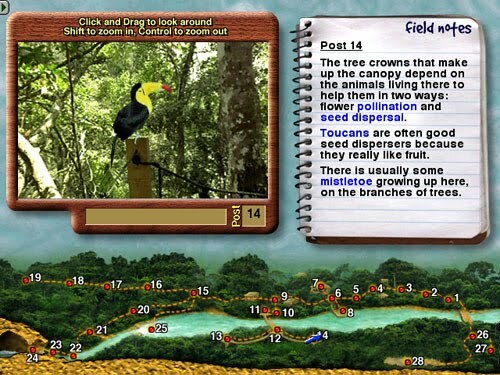 Below is an example from the Rainforest field trip. 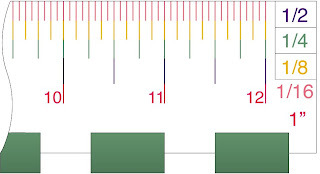 The left-hand corner is the scene that you view. The right-hand corner has the field notes, some of which are click-able. The bottom section shows the trail with all of the posts that you can visit. This is just one small portion of the CD though. So many other things are included. You will need to use the map provided to be able to successfully navigate through it all. The map looks like a family tree, branching its way down from one thing to the next. The sections are expansive and include so many topics. Some are informational. Some are interactive. 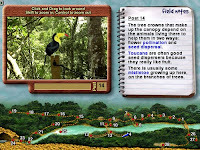 Some are animated graphics with audio. A wide variety to help hold a child's interest and expand their knowledge. So as you can see, the CDs cover a wide variety of topics. 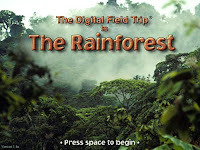 It is a virtual field trip, but it is also so much more. 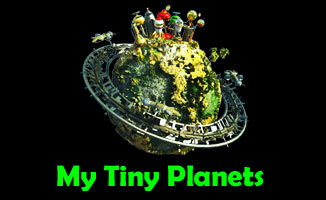 I am going to include some snapshots to give you a feel for it. This is one of the interactive screens. This is an informative screen, with links to more details. 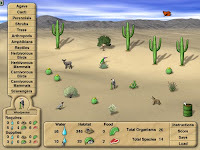 An interactive one from the Desert. So cute. Once I got the hang of it, I found this to be both fun and educational. The field trips can be purchased separately. But the combo is the best deal, price-wise. 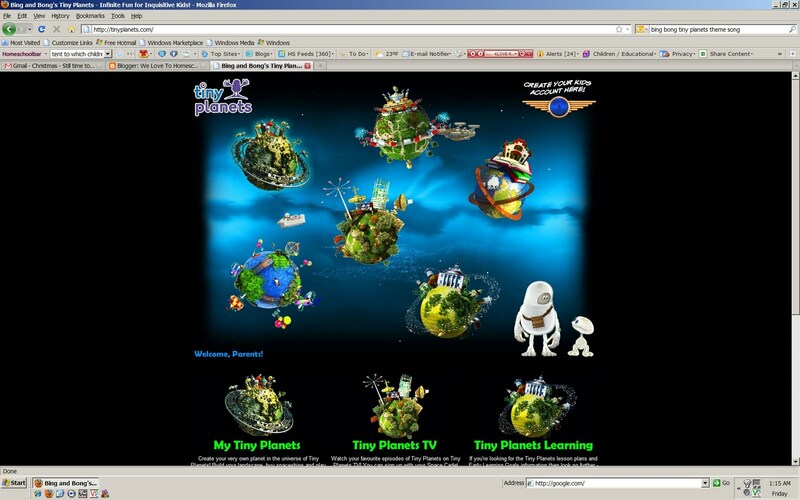 The company offers a DemoWare. This is a CD with samples of all of their products, including workbook samples. You can download it for free or have it shipped to you for $5. Disclaimer: I received Digital Field Trip free of charge, as part of the TOS Homeschool Crew. The above is just my opinion. Please remember that opinions may, and do, vary.